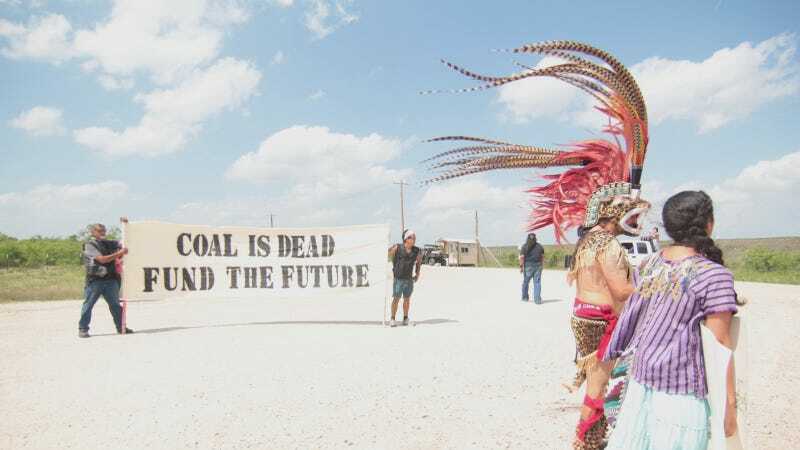 On Saturday, April 16, Ward joined approximately 150 protesters, many of them Native American, as they walked from Independence Bridge on the Texas-Mexico border to the gates of the Dos Republicas coal mine 8.5 miles away. Many more followed by car. Some played drums or flutes, singing traditional songs, while others danced adorned in feathered headdresses or wrapped in deer skins. They came from across Texas, some even traveling from as far as Southern California to participate in the march. Traffic came to a standstill in Eagle Pass, TX, where the protesters congregated to protest the coal mine, which recently started operating just miles outside of the city. Among the group were members of the Texas’ Lipan Apaches, the Pacuache Band of the Cohuiltecan Nation, the Carrizo-Comecrudo Tribe, the Kikapoos, and various chapters of the American Indian Movement. Indigenous protestors contend that many significant sites, including burial grounds and sacred lands, lie within the proposed mining area, and that by federal law they should have been consulted before permits were issued. They’ve called on the Army Corps of Engineers to rescind the mine’s permit and halt the destruction of their ancestral lands. "This community is one of the ten poorest in the United States, and it’s taking all this environmental stress." The mine’s permit application itself, submitted to the Texas Rail Road Commission in 2008, lists over 70 cultural resource sites within the proposed impact area. It reads like a blueprint for destruction, detailing in one column the archeological significance of each site and in the next what Dos Republicas plans to do to it. A prehistoric open campsite will become a drainage area. Sites scattered with lithic artifacts will be cleared for railway tracks. Torres can trace her lineage back to the founding families of Eagle Pass, a town of just over 25,000 people. She has pictures of her grandmother posing on the banks of Elm Creek during a family gathering in 1917. “They considered it sacred waters,” Maria said, speaking of her ancestors. Today, those same waters are being used as a drainage conduit for mine runoff. The open-pit mine, which began operating last fall, is owned by Dos Republicas Coal Partnership, a subsidiary of the Mexican mining conglomerate Minera de Norte. The low-grade coal being extracted from the 6,346 acre mine is too dirty to be burned in the United States under President Obama’s Clean Power Plan. So it is shipped by a train, privately owned by Minera de Norte, across the border to Mexico where it is burned in coal-fired power plants in Nava, Coahuila, a half-hour drive south of the border. These power plants are not subject to the same stringent environmental regulations that comparable coal-burning plants in the United States are subject to and are considered some of the dirtiest plants in North America. A representative for Dos Republicas, Rudy Rodriguez, told Fusion by phone that they have gone “above and beyond what was called for in the permitting process.” He estimates that the mine will contribute approximately $1 million a year to the local economy in the form of property taxes alone and will create hundreds of jobs. Martha’s fears are not unwarranted. Coal seepage and storm drainage from the Dos Republicas mine will be dumped into Elm Creek, which eventually runs into the Rio Grande one mile upstream from where Eagle Pass gets its potable water. Then there was an incident in which hundreds of fish were found dead in Elm Creek following heavy flooding last October just days after the mine opened. The cause of the fish death is under investigation, but the TCEQ said it could be due to a lack of oxygen. Residents are also concerned about the level of ash and other air contaminants resulting from both the train running through the center of the city and from the actual burning of the low-grade coal in plants just across the border. For Hook, the Baxters, and other residents of Maverick County opposed to the mine, the coalition of Native American protesters that marched in Eagle Pass are welcomed reinforcements in an already decades-long battle that began when the mining project was first proposed in the 1990s. “We are overjoyed that they are supporting us and are hoping that this will open up another avenue for more legal action,” said George Baxter, who is already working with a law office in Austin to investigate the Native American’s claims. Five years ago locals and environmentalists tried to stop the Texas Railroad Commission from granting Dos Republicas a permit to mine coal at the site, but the permit was awarded in 2013 and has survived several court challenges since. As the marchers approached the mine late in the afternoon Saturday, you could hear the distant rumble of heavy machinery underneath the sounds of the drums and voices—a stark reminder to the protestors of the destruction already taking place on their sacred lands. More than a million tons of coal from the Dos Republicas mine has been shipped to Mexico since it opened last October. Dos Republicas is ultimately planning on expanding the mine an additional 25,000 acres.